Following a huge string of terrible manufacturing reports from nearly every Fed region, I received this headline report from the New York Fed: Regional Service Sector Resilient even as Manufacturing Slumps. The October 2015 Business Leaders Survey of regional service firms, released today, paints a considerably more benign picture of local business conditions than the more troubling October 2015 Empire State Manufacturing Survey, released yesterday. The two surveys point to diverging trends in the regional economy: manufacturing firms report that business activity has weakened, on balance, for the third month in a row, while regional service firms, though far from euphoric, remain slightly positive, on balance, about business trends. One of the reasons for this divergence seems to be the strong dollar, which has had negative effects on far more manufacturers than service firms, according to our surveys. The Empire State Manufacturing Survey has been giving signals of weakness for the past several months. The headline index hovered around zero—the breakeven level at which the same number of firms characterize activity as increasing as declining—from April through July, and then tumbled to below -10 from August through October. The last time the survey’s headline index remained this negative for this long was during the deepest part of the Great Recession, from the fall of 2008 to the spring of 2009. This would be a worrisome sign indeed if it were matched by comparable negativity in the service sector—as was the case in 2008 and 2009. However, over the last three months, the headline index from the service sector survey has remained at least slightly above zero, marking the most sustained divergence between the two surveys in this direction since they have both been in the field (beginning in 2005). The Business Leaders Survey blamed manufacturing on the strong dollar. But what about services? Let's dive into the report for details. 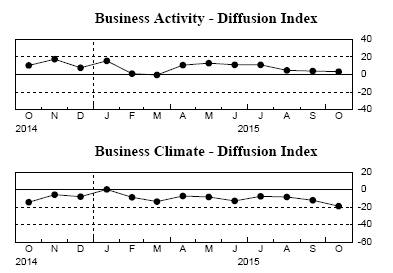 For three months the business index was barely above contraction. The September reading was 3.76 and October 3.01. 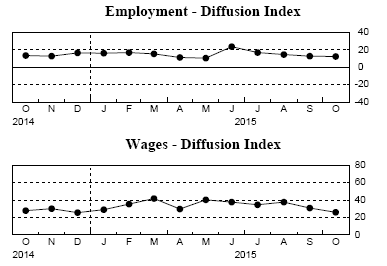 The business climate component has been negative or zero for over a year, only touching the zero-line once. I suspect the difference between prices paid and received has much to do with business climate. Although both prices paid and prices received are in positive territory, check out the huge divergence. 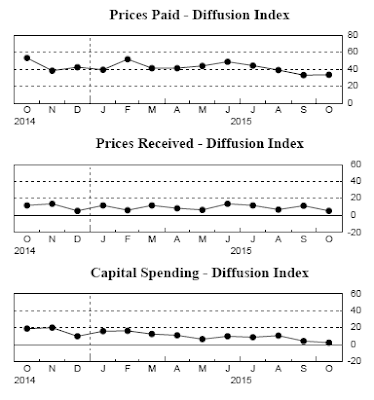 Far more firms are reporting input prices up than prices received. 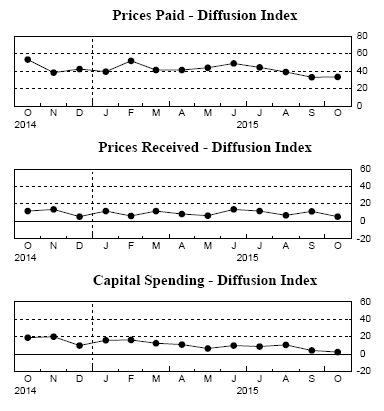 The prices paid index rose from 32.84 in September to 33.33 in October. However, the price received component fell from 11.36 to 5.38. Another drop like that and prices received will be in contraction. And note Capital Spending collapsing towards contraction. The index fell from 4.55 in September to a barely positive 2.31 in October. Wages and employment are both well in positive territory, but how good is it that wages are going up, input prices are raising, while prices received are close to contraction? Some ominous trends are on the horizon in capital spending, prices received, business activity, with the business climate solidly divergent from the other positive readings. This report is a strong warning sign that services may be ready to stall.